Sun., Aug. 26, 2018, 4:10 a.m. 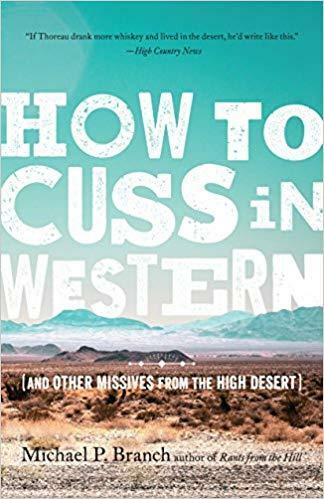 The deft essays in Michael Branch’s “How to Cuss in Western (And Other Missives from the High Desert)” remind me of Patrick McManus, the former Sandpoint resident, EWU professor, novelist and humorist. He collected his writing in books that began with “A Fine and Pleasant Misery” in 1978. Not that Mike Branch sounds like McManus; rather that he’s part of an enduring succession of outdoor journalists. From 2010 to 2016, for High Country News, Branch wrote an online column that he dubbed Rants from the Hill. In that column, he described life with his wife and daughters on 6,000-foot-high “Ranting Hill.” This year, the family came down from the hilltop to live again in Reno, the same year McManus died. Ordeals of biblical proportions afflicted the Branch family during its hilltop sojourn. Roads washed out, wildfires forced retreats, gophers and packrats pestered, snowstorms hurled down. Their solar abode caught fire. Such accounts blur and blend with those in the sister volumes “Raising Wild” (2016) and “Rants from the Hill” (2017). The family underwent a fine and pleasant misery in the high Nevada desert. Just as the ancients chased acclaim on that mountain named Parnassus, Branch sought wisdom and inspiration in the Silver Hills that serve as setting for most of these short essays. The locale will invite comparisons to Mark Twain, who lit out early for the Nevada Territory with his brother Orion and wrote up the tall tales that pepper “Roughing It” (1872). Twain practiced slapstick. He awarded an angry bison the ability to climb a tree and a coyote the speed to activate a sonic boom. He poured on the self-deprecation when he tried to give up smoking. Branch pours IPA, rye whiskey, and a frequent “tumbler of sour mash” while breathing satisfaction for the domestic life. Like Antaeus in Greek mythology, Branch is best when in close contact with planet Earth. Indoor settings – a Department of Motor Vehicles office, for instance, or a Reno casino – slow the pace and blunt the wit. His outdoor scenes, though, writhe with life. One of the most tender and accomplished among them is “Desert River Music.” With a guitarist friend in downtown Reno, he blows a harmonica and mounts an impromptu concert for homeless folks. Another essay, a broad satire in the tradition of Twain, takes as its title “Will the Real Fake John Muir Please Stand Up?” That narrative transports readers to a Chautauqua where entertainers impersonate the immigrant Scots writer by sporting beards and brogues with varying degrees of authenticity. Branch makes his narrator a strict inquisitor to flush out the phoniest of the fake John Muirs. Published: Aug. 26, 2018, 4:10 a.m.